Larsen Steel Sheet Pile Construction Among them, the Larsen steel sheet pile is very important. In the construction of the strict Larsen steel sheet pile cofferdam, it is necessary to ensure the correct position of the Larsen steel sheet pile and the verticality of the Larsen steel sheet pile. To control the Larsen steel sheet pile into the precision, to prevent the Larsen steel sheet pile buckling deformation and improve the penetration of Larsen steel sheet pile capacity, which must be installed Larsen steel pile pile piling guide, we will come to introduce the next Larsen steel sheet pile guide how to install? 1、Larsen steel sheet pile guide frame with single-layer double-sided form, usually by the guide beam and purlin piles and other components, the spacing of the purlin piles are generally 2.5 ~ 3.5m, double-sided friction between the spacing should not be too large, Generally slightly worse than the thickness of the pile wall 8 ~ 15mm. 2、the installation of Larsen steel sheet pile guide frame to use theodolite and level control and adjustment guide beam position. 3、Larsen steel sheet pile beam height should be appropriate, it is necessary to help control the construction height of Larsen steel sheet pile and improve the construction efficiency. 4、Larsen steel sheet pile guide beam can not be with the Larsen steel sheet pile into the deep and produce subsidence and deformation occur. 5、Larsen steel sheet pile beam position should be as vertical as possible, and can not collide with the Larsen steel sheet pile. 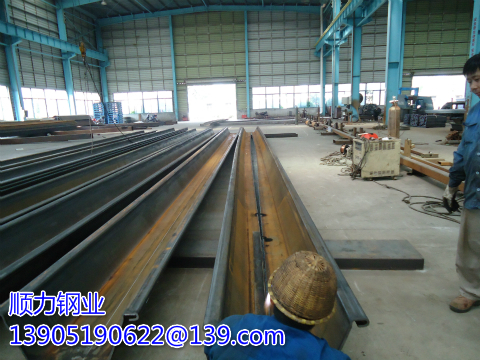 6、to determine the above points, the Larsen steel sheet pile guide beam welding to form Larsen steel sheet pile guide can be. As the above chart in the Larsen steel sheet pile does not form a lock, so the Larsen steel sheet pile guide spacing is relatively small, in the actual installation of Larsen steel sheet pile guide frame, we have to select the Larsen steel sheet pile model to determine Larsen steel sheet pile guide frame spacing size. In the actual Larsen steel sheet pile construction process, generally in the municipal pipe network Larsen steel sheet pile support project on the use of less use Larsen steel sheet pile guide, because such projects generally Larsen steel sheet pile vertical requirements are relatively low, So the operator according to the naked eye observation to play Larsen steel sheet pile is also possible.